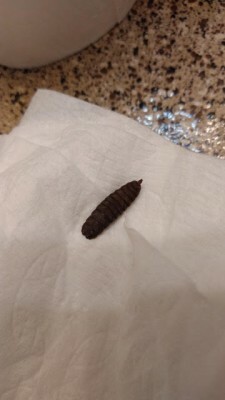 Are Black Soldier Fly Larvae Dangerous? Although we already had total faith that our reader properly identified the specimens as black soldier fly larvae, now upon seeing the photo we can confirm this without a doubt. Black soldier fly larvae, or BFSL for short, are generally known for composting because they are excellent at breaking down organic substrates and returning nutrients to the environment. They eat manure, compost, and other organic waste such as dead and decaying organisms. So, to answer our readers question, they don’t typically eat clothes, books, or bedding. They also don’t bite and aren’t known to transmit any human diseases, so they aren’t typically considered dangerous. In other words, our reader does not need to panic! We aren’t sure why these larvae are burrowing into his carpet, but like we mentioned, their food sources are limited to organic materials and waste. 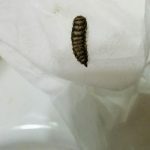 In order to get rid of these larvae our reader will need to search for the initial food source and remove it, and thoroughly clean his room to get rid of any other potential food sources. A good place to start his search is the trash can in his room, and anything else suspicious in the corner where he initially noticed the creatures (maybe an old sandwich in a backpack?) He should not only empty the trashcan, but also clean the recepticle itself. If he is still finding larvae despite his best cleaning efforts, we recommend he sprinkle diatomaceous earth around his bedroom. Diatomaceous earth, or D.E., is a powder made up of fossilized aquatic organisms. It kills invertebrates upon ingestion but is harmless for humans and pets to consume. This should at least stop the recurring cycle of BSFL in his home if he is unable to find a food source. He can also seal the windows and doors around his home to prevent other organisms from sneaking in from the outside world. In summary, a reader reached out to us about an infestation of BSFL in his bedroom. We don’t know exactly why these composting organisms are living in our reader’s room, but we don’t think he needs to panic. Instead, he can focus his energy on cleaning and sealing off the tiny, bug-sized entryways to his home. 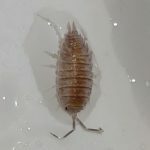 A reader reached out to us about an infestation of BSFL in his bedroom. We don't know exactly why these composting organisms are living in our reader's room, but we don't think he needs to panic. Instead, he can focus his energy on cleaning and sealing off the tiny, bug-sized entryways to his home. 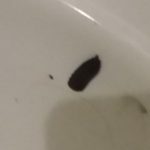 I found worms in my chinchilla’s food bowl and was wondering if you guys could help me figure out what it was! It would be greatly appreciated as I am freaking out. Hopefully they’re nothing.